The hiring outlook for 2017 is the best the U.S. has seen in a decade with 2 in 5 employers (40 percent) planning to hire full-time, permanent employees over the next 12 months, according to CareerBuilder’s annual job forecast. 3 in 10 expect to hire part-time, permanent staff, while half of all employers anticipate adding temporary or contract workers. The national survey, conducted online by Harris Poll on behalf of CareerBuilder from November 16 to December 6, 2016, also indicates that employers will offer better wages, place emphasis on candidates’ soft skills and reach out to candidates via texts to invite them for job interviews. It included a representative sample of 2,391 hiring managers and human resources professionals across industries and company sizes. Three in four employers reported that they are in a better financial position than they were a year ago, which is instilling more confidence in adding people to their payrolls. Following a divisive election season, employers are entering the New Year with a watchful, yet optimistic approach. One of the key challenges for employers will be bridging the talent gaps within their own organizations by either offering better wages or by helping to re-skill and up-skill workers. When asked for their opinion on how the Trump administration will impact hiring in 2017, 23 percent of employers said the new administration would increase jobs while 27 anticipated no impact. 7 percent said they expect jobs to decrease while 43 percent were undecided. The amount of employers planning to hire full-time, permanent staff in the New Year increased 4 percentage points from 36 percent in 2016 to 40 percent in 2017. Employers in information technology were the most likely to say they were adding new employees at 56 percent, a notable 12 percentage point gain over the prior year. 8 percent of employers across industries expect a decline in staff levels in 2017, an improvement from 10 percent last year. 44 percent anticipated no change while 9 percent were unsure. In terms of part-time employment, 30 percent of employers expect to increase their number of part-time, permanent employees in 2017, up from 26 percent last year. The demand for temporary labor will continue to be strong as employers strive to have more flexibility in their staff levels. 51 percent of employers plan to hire temporary or contract workers in 2017, an increase from 47 percent last year. 63 percent of employers plan to transition some temporary or contract workers into permanent roles in 2017, up from 58 percent last year. Companies will be under pressure to offer higher pay – Two-thirds of employers (66 percent) plan to increase salaries on initial job offers; 30 percent of all employers will increase it by 5 percent or more. Nearly half (47 percent) of employers expect to increase the minimum wage at their organizations and, of these employers, 44 percent will increase it by $3 or more; 20 percent will increase it by $5 or more. Job seekers will need to emphasize their soft skills –When evaluating who they will hire in 2017, 62 percent of employers rated the candidate’s soft skills as very important (i.e, skills associated with one’s personality such as positive attitude, team-oriented or dependable). Employers will communicate with candidates via text – 41 percent of employers said they will follow a recent trend and reach out to candidates via text messages to schedule interviews. Workers in general will need to become more savvy on social media – 63 percent of employers said they expect employees across job functions to have some experience with social media. More companies will be open to hiring workers who are short on experience – 55 percent of employers said they will train workers who don’t have experience in their field and hire them in 2017. 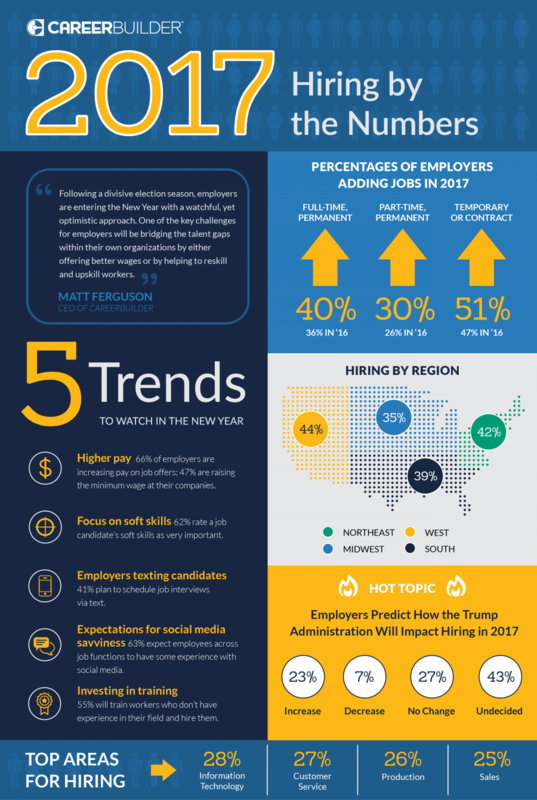 See the infographic below courtesy of CareerBuilder for the full annual jobs forecast for 2017.